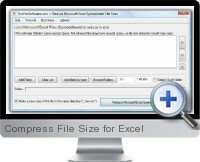 Compress File Size for Excel is a utility to shrink the byte size of Excel files. Complex Excel analytical and data centric models can grow in size taking up valuable disk space and network bandwidth on distribution. Compress File Size for Excel can compress multiple Excel files in batch mode to save network resources and improve transmission speeds. Condense and shrink multiple files at once quickly. Create a copy of the original files for compression. Option to search sub folders for Excel files to compress. The compression level depends on the amount and structure of data in the original file(s). Compress File Size for Excel works for versions of Excel 2000 and higher.